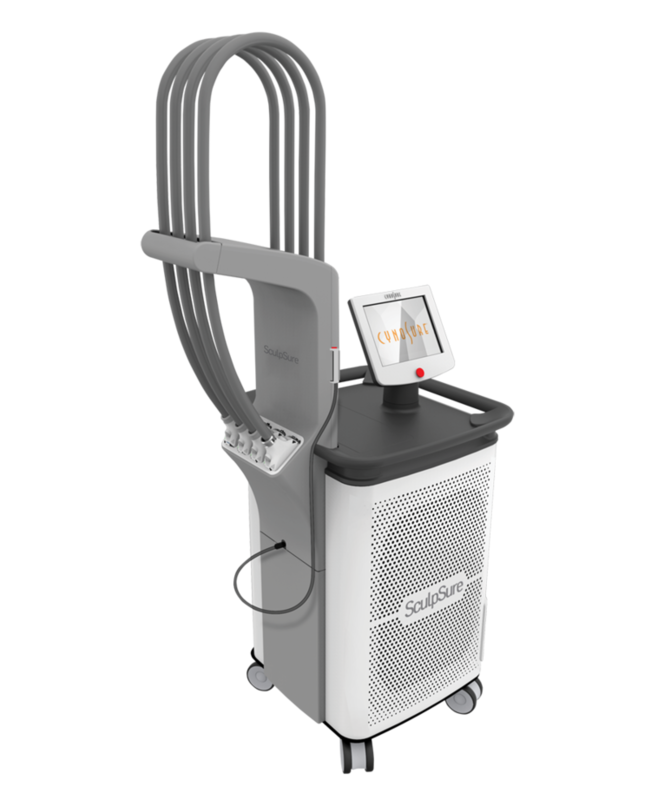 We are excited to be offering in our practice a new external laser-based fat reduction procedure using a new FDA approved device called SCULPSURE manufactured by a leading medical laser technology company, CYNOSURE. This device achieves results comparable to the fat freezing device COOL-SCULPT but uses a heating of the fat layer instead of freezing. The procedure takes only 25 minutes to perform, in comfort, and uses flat paddles instead of the suction paddles of COOL-SCULPT; therefore the energy can be delivered in a more uniform manner rather than segmental areas which fit into the suction paddles of COOL-SCULPT. Also the SCULPSURE treatment time is considerably less than half the time of COOL-SCULPT. As in other devices which deliver external energy to the fat layers. SCULPSURE. for comfort and safety reasons, is designed to reduce approximately 25% of the fat cells exposed to the energy. The results of the treatment are gradual over the next several weeks as the dead fat cells are removed by your body’s own reparative mechanisms. The treatment can be repeated if desired. SCULPSURE is not a direct substitute for Surgical Liposuction which produces immediate almost complete reduction of fat deposits, but requires an invasive procedure frequently requiring anesthesia, and with a more painful downtime. There is generally no downtime from normal activities following the treatment with SCULPSURE. We expect to be receiving the SCULPSURE device in January 2016, and are pleased to offer this service if applicable for you. Consultation for this procedure at no charge. © 2019 Gary Tearston M.D.